A.L. Breguet opened the doors of his now legendary watchmaking business in 1775 on the Quai de l'Horloge, Paris. For the next two centuries, the pioneering artistry of his company helped to shape the world timepiece industry. Today, it stands as one of the pillars of both style and innovation in watchmaking. Many of the most important advancements in watchmaking originated from the house of Breguet. * Breguet launched the first self-winding watches known as "perpetuelles" in 1780, invented the gong spring in 1783, and the perpetual calendar in 1785. * The company has patented a movement with equation of time and calendar, both functions as perpetual and automatically self-correcting over a period of more than a century. * The Tact Watch was invented to allow the wearer to tell time by touch. This "watch for the blind" was sold from 1799 and was typically limited to non-striking styles. * Breguet patented the regulating device known as a tourbillon in 1801. Classique Featuring a self-winding movement with date, power-reserve indicator, and phases of the moon, this elegant beauty is one of the most popular models of the collection. 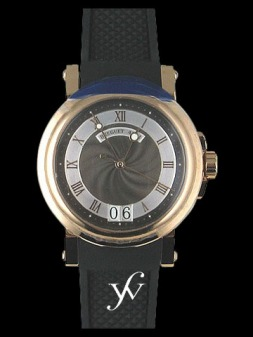 The silvered gold dial is hand-engraved on a rose-engine and has a sapphire caseback. Water resistant, this watch comes in yellow gold or white gold. Marine This watch is fitted with a chapter ring with Breguet Roman numerals and luminous minute-markers. It features a large date at 6 o'clock and an engine-turned caseback with sapphire crystal. The piece comes in 18K yellow gold, with a silvered 18K gold dial. Heritage An 18K white gold masterpiece, this watch has a self-winding movement, with an engine-turned and silvered gold dial. A large date is set at 12 o'clock. Small second hands are at 6 o'clock. This model is available in both 18K yellow gold as well as pink gold.